With estimates from £450-9000, here are five previews from upcoming sales this week. 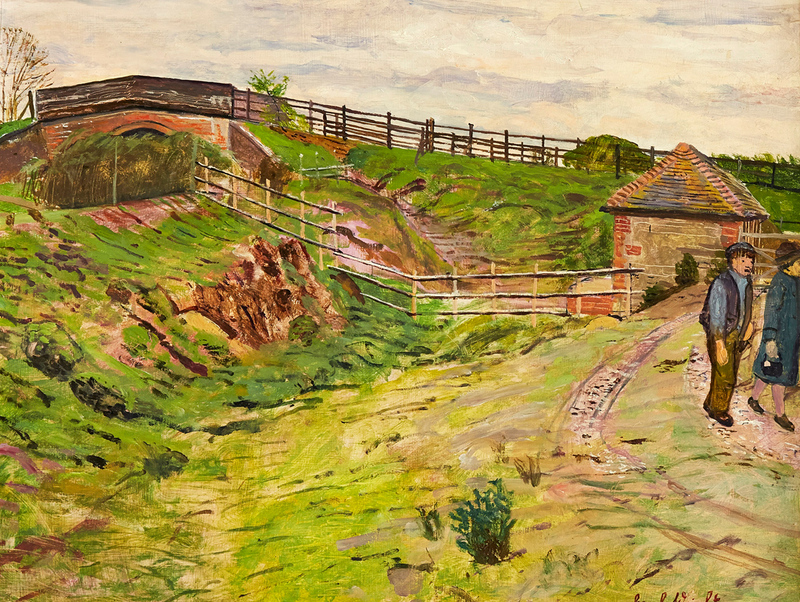 Roseberys will offer this Carel Weight oil painting estimated at £2000-3000. 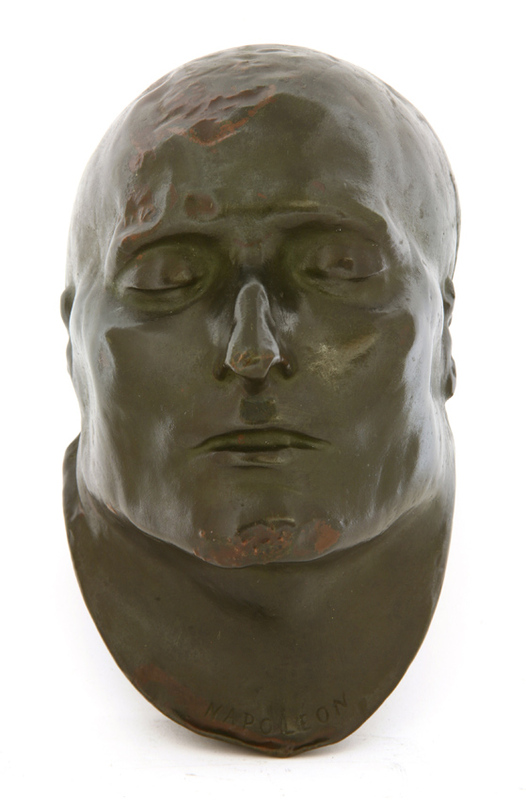 This death mask of Napoleon Bonaparte will be offered at Sworders’ ‘Out of the Ordinary’ with an estimate of £800-1200. Shortly after Napoleon Bonaparte died in 1821 on the remote island of St Helena in the South Atlantic, his physician, Dr Francois Carlo Antommarchi, made a death mask of the famous military leader. On Antommarchi’s return to Europe, the plaster cast was reproduced in bronze and other materials. This electro-type copy was once the property of Alexander Meyrick Broadley (1847-1916), a noted collector of Napoleana. Estimated at £800-1200, the piece has been consigned by television antiques expert Tim Wonnacott to Sworders’ Out of the Ordinary auction in Stansted Mountfitchet, Essex, on February 12. View the lot on thesaleroom.com. 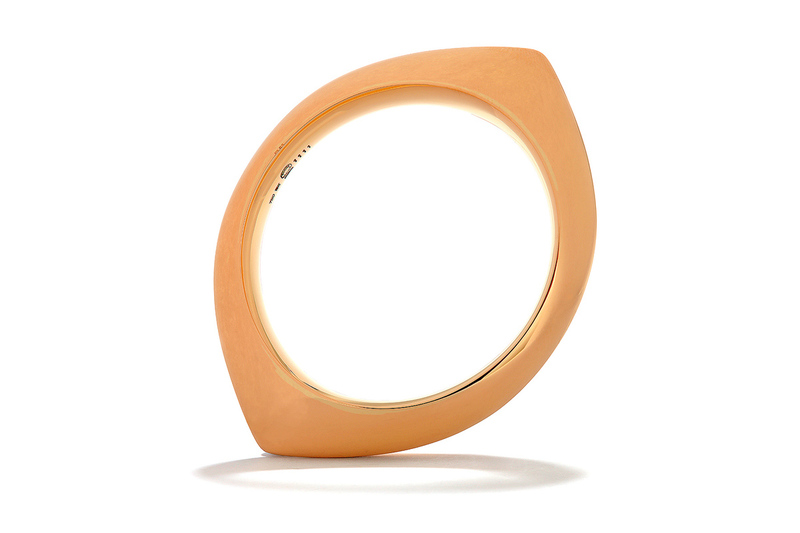 This bangle by Danish designer Nanna Ditzel will be offered at £1500-2000 at Chiswick Auctions. Danish designer Nanna Ditzel (1923-2005) holds the distinction of having been the first woman to design for Georg Jensen. Ditzel began designing jewellery for the company in 1954 as something she could do at home while her children slept. Her creations went on to win a variety of awards and prizes. This polished openwork navette form bangle, in pattern 1111 and signed Georg Jensen, is guided at £1500-2000 in a jewellery sale at Chiswick Auctions on February 12 in west London. View the lot online at thesaleroom.com. This oil is typical of Carel Weight’s (1908-97) later post-war work - in which alienated figures wander in and out of the picture, contrary to the normal compositional rules of landscape painting. The signed 13 x 17in (33 x 44cm) oil on board comes from the private collection of a friend of the artist and will be offered for sale at Roseberys in West Norwood, London, on February 12 with an estimate of £2000-3000. View the lot on thesaleroom.com. This c.1920s pocket knife shop display case, made for Taylor’s Cutlery of Sheffield, is estimated at £450-650 at C&T Auctioneers. 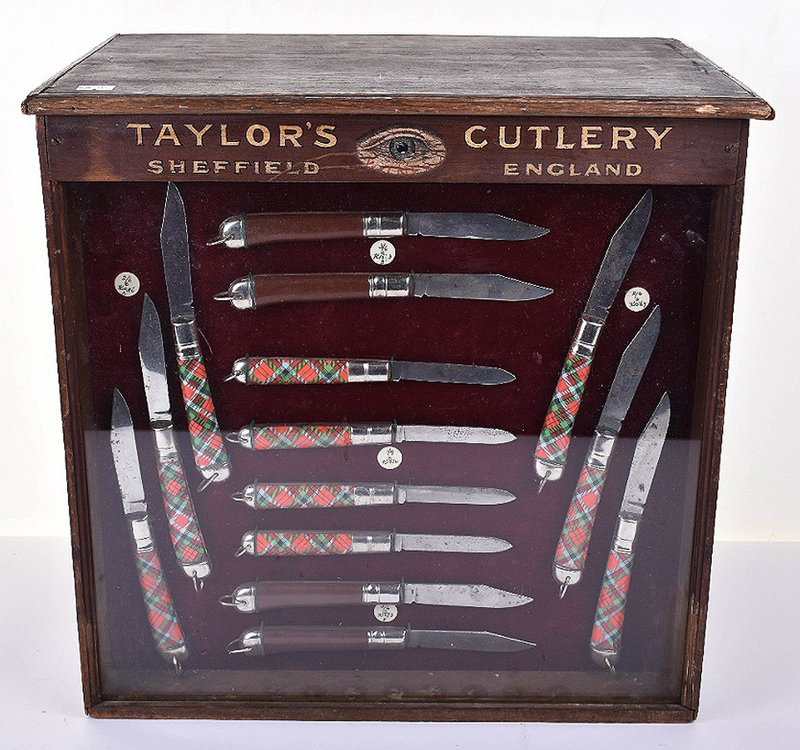 This c.1920s pocket knife shop display case, made for Taylor’s Cutlery of Sheffield, is estimated at £450-650 at C&T Auctioneers in Tunbridge Wells, Kent, on February 12-13. The box contains 14 types of knives with price tokens at 1/9, 2/6, 3/6. The top of the case is painted with the company’s ‘Eye Witness’ logo. View the lot on thesaleroom.com. An 1880 oak centre table designed by Philip Speakman Webb will be offered at Lyon & Turnbull's ‘Paul Reeves: An Eye for Design’ sale at £7000-9000. Morris & Co produced a number of Arts & Crafts tables in this style for high-profile commissions, including a similar table for the Pre-Raphaelite painter Edward Burne-Jones in the 1850s. 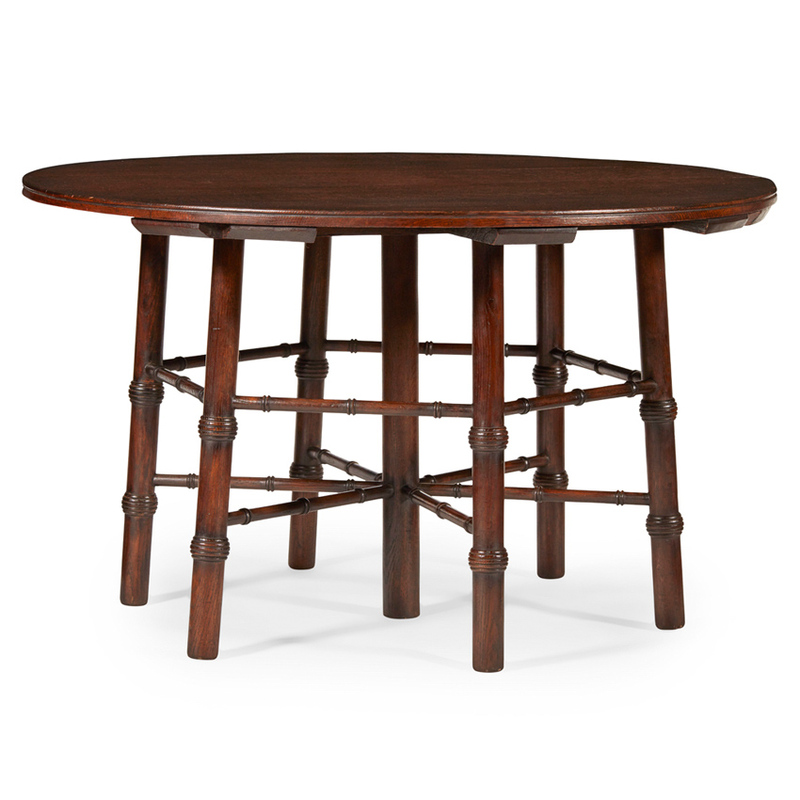 This later 1880 oak centre table, which stands on six ring-turned legs and central turned column, was designed for the firm by Philip Speakman Webb (1831-1915). The 4ft x 2ft 4in (1.22m x 72cm) piece forms part of Paul Reeves: An Eye for Design, a collaborative sale between dealer Paul Reeves and Lyon & Turnbull, which will be held on February 14 in Edinburgh. It is estimated at £7000-9000 and can be viewed online at thesaleroom.com.